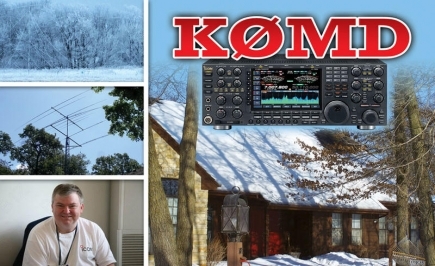 I currently have two rigs at the home QTH. Station A is an Icom 7800 coupled with an Alpha 78 amplifer. Station B is an Icom 7600 coupled with an Acom 1010 amplifier. The Icom 7000 and Acom 1010 are also used for overseas operation, as the Icom 7000 fits into my briefcase and the Acom 1010 fits into a Pellican case for luggage transport in the airplane. I use a remote antenna switch, the Array Solutions 8 Pak, which allows any of 8 antennas to be switched between two rigs . It is a great remote switch. I use the WXØB stack match for my 10-20 stack (C49XR at 100/C49XR at 40) and I have an M2 Orion 2800 rotator for the top yagis and a K0XG Ring rotor for the C49XR. I have a Force 12 160 meter vertical for 160 operation. It has a SWR < 2:1 over 40 Khz of bandwidth. I have it tuned to work 1810-1850 Khz. The 80 antenna is a four square array using the Force 12 sigma 80 vertical dipoles. This array is very suburban friendly and does not require elevated radials. i use a Force 12 Magnum 240 N 2 element yagi at 110 ft and 40 meters is like 20 for me. I hear lots of DX from Asia, Europe and Latin America and can work most of what I hear. 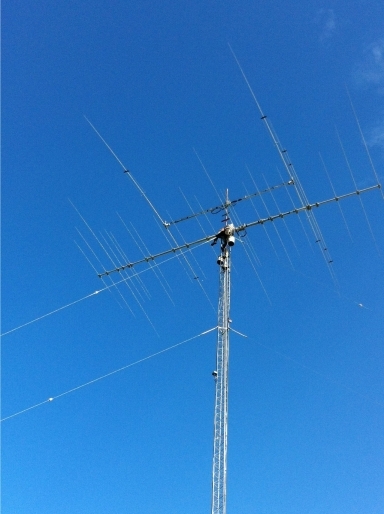 It is a lot of fun to have a 40 meter Yagi at 110 ft. I decided to go with a stack of Yagis for the workhorse bands. I took the advice of Dean Straw N6BV and Mark Hooper (N5WEB) for this set up. I bought two used Force 12 C49XR Yagis. I used to use a Force 12 C31XR. Both work well and I credit Jay T at Array Solutions for designing the stack match which allows me to phase them. Dean Straw was right when he said a stack beats a single yagi with more elements. I went with a Force 12 4 BA yagi for 12 and 17 meters since this antenna gives me coverage on 10 and 15 also when I need to run the C49/C49 stack on 20. The 4 BA has 3 elements on 10/12 and 3 elements on 15/17 meters. I bought it used from Tom Lutz of the TCDXA.